Second Agile Belgium Drinkup gathered 7 people from different horizons. Developers and Coaches. We exchanged some of our concerns and experiences on how to bring Agile practices into the day to day life of a freelance developer. We had an interesting discussion about ways to make a customer understand that he won’t necessarily need everything from it’s backlog to launch a project. Alain Ravet suggested to use belgian comics for that purpose. 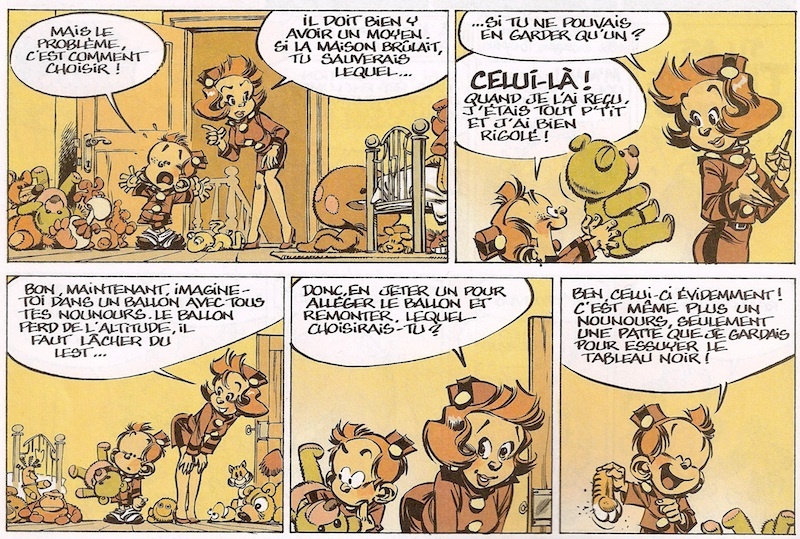 He uses a story from “Le petit Spirou” or “De kleine Robbe” where his mother asks him to choose some teddy bears he could give away to poor children. Of course he says he wants to keep them all, that they are all important to him. His mother then asks him which one he would grab if the house was on fire and he could only take one with him. And she goes on and on, making him imagining all kinds of situations until there are two piles of teddy bears, the ones he really likes and the ones he doesn’t really need. Here’s a picture of it, in french, if anyone has it in dutch, I guess it’s ok to post it in the comments. If you want to read the full comic, it’s in album 7 Demande à ton père/Vraag dat aan je papa! Another holiday Agile Belgium Drinkup, gathering 4 people this time. We forgot to send an email to the mailing list, which didn’t help. But still, again, interesting things happened. We raised the tricky question. If you are new in the community or a newly graduated student that would like to apply in a company being Agile, or if you are more experienced and are looking for a job related to Agile, in which company do you actually apply? Should there be someone writing down a list of Agile companies in Belgium? Not really. So what can we do then? There was a suggestion from Pascal to add some job board to the actual Agile Belgium blog. Companies that really want to find some Agile aware profiles would pay a fair amount to have their offer published on the Agile Belgium job board. Of course this is just an idea, and we need to know if some companies would be interested, and at what price. So, taking actions! Pascal volunteered to write an email explaining the idea. Email that we would send to companies in Belgium that are related to Agile in any ways. We’ll engage in further development if there are companies interested. If you want to help, we are trying to build a long list of companies that are or might be interested in Agile, if you know such companies, drop us an email. When is the next Agile Belgium Drinkup? The fourth Agile Belgium Drinkup will happen on the 14th of September, still at the Delirium Café at 7 p.m. You can already register here http://abdup.fikket.com/ we hope to see you there.